Settled in 1812, Columbus is the state capital of Ohio and one of its most populated cities. Home to over 800,000 people, residents depend on the city’s infrastructure to provide them with a good quality of life. This includes regular road maintenance to ensure a safe work commute or up-to-date piping to get them clean water. However, one of the city’s (and state’s) main transportation arteries has become quite clogged. Built nearly half a century ago in the 1960s to accommodate an 125,000 vehicles per day, today, the I-70/I-71 interchange sees 175,000 a day — a whopping 40 percent more vehicles than it was designed for. According to ODOT, this interchange is one of the most congested areas in the state, and is ranked fourth statewide for crashes, averaging two collisions a day. Help is on the way, though, for Columbus, Ohio residents. The Interstates 70/71 Columbus Crossroads project is a large, multi-year, civil project, which is fixing the biggest safety and congestion problems along the interstate in the downtown Columbus, Ohio corridor. The multi-billion dollar, multi-phase project calls for extensive construction in order to rehabilitate and improve the split, including road paving, bridge reconstruction, and sewer system updates. The Interstates 70/71 Columbus Crossroads project is a large, multi-year, civil project, which is fixing the biggest safety and congestion problems along the interstate in the downtown Columbus, Ohio corridor. 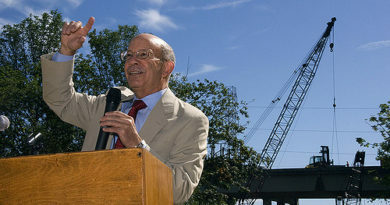 The project calls for extensive construction, including road paving and bridge reconstruction. The new sewer is being installed over a length of one block that is bordered narrowly between a western section of the I-70/71 corridor and an apartment building. The team assigned to the project has also been focusing on the installation and rehabilitation of underground utilities, such as the miles of pipes for gas, water, and sewers, which are just as important to maintain the integrity of the infrastructure project. Taking on the behind-the-scenes, though no less extraordinary, task is highway construction company Shelly & Sands, Inc. (SSI). 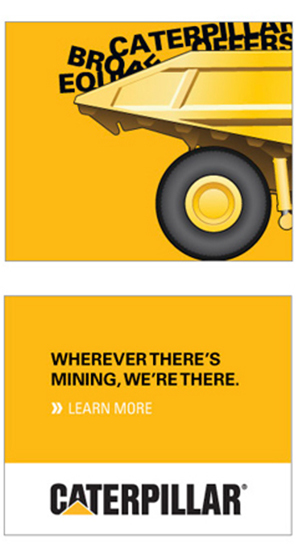 The company, which is based in Zanesville, Ohio, serves eight major markets in three states and paves roads throughout Ohio. The project called for the installation of a new sewer system that diverts water from a large existing sewer line through four hydrodynamic separators. These separators then “clean” storm water runoff before it is discharged into the Scioto River. This particular excavation project proved to be exceptionally complex. 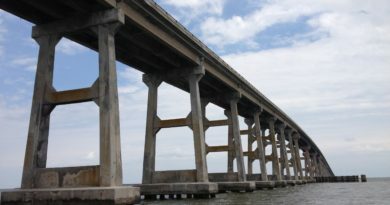 It was, in fact, four different excavation projects; each a different depth; some with different soil condition; some with existing crossing utilities to navigate; and each having different sized pipes, structures, and manholes to install within. Complicating matters further was the fact that the Best Management Practices (BMP) sewer project needed to be installed over a length of one block that was bordered narrowly between a western section of the I-70/71 corridor and an apartment building. A Slide Rail shoring system is considered a positive shoring system, according to manufacturer Efficiency Production. 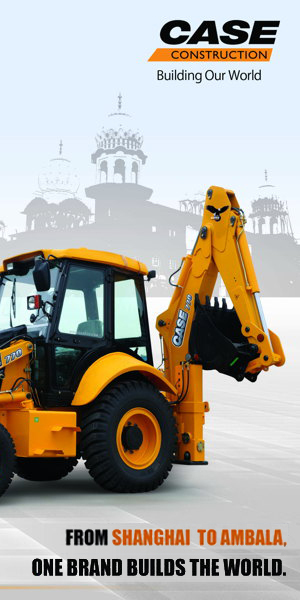 It maintains constant pressure against the sides of the excavation and requires no overdigging. 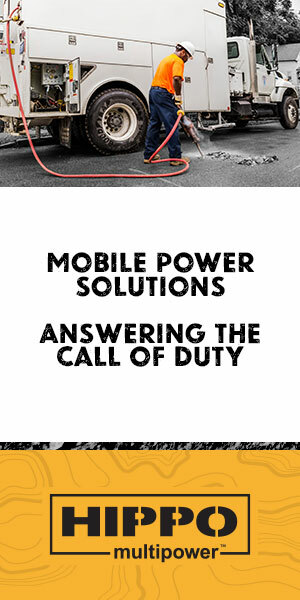 This prevents possibly undermining or disturbing the surrounding foundations of buildings, roads, or other structures. 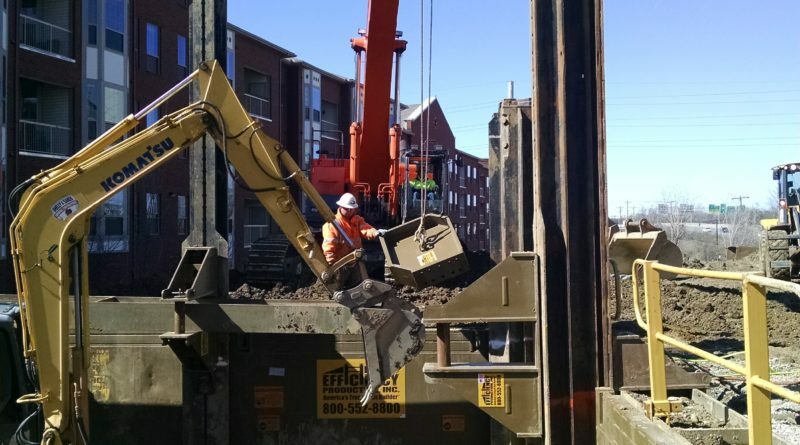 A positive shoring system is a critical requirement for approval from most states’ Department of Transportation—including Ohio’s—for any underground construction. All four excavation points were deeper than five feet and required a trench protection system per Occupational Safety and Health Administration (OSHA) regulations. What’s more, with a highway and an apartment complex on each side, workers would be unable to vibrate in any sheeting or drive in a lag wall. 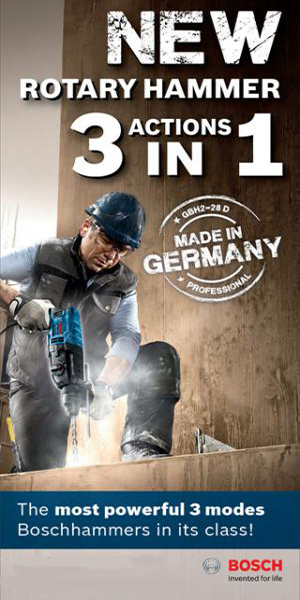 “So when we got down to it, really the only thing that would facilitate our need was a dig-and-push shoring system,” said Snode. 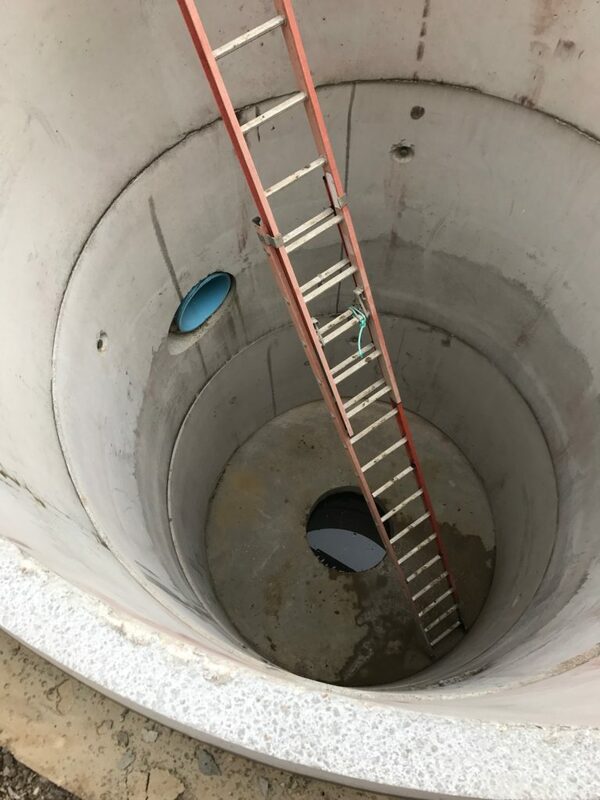 This allowed them to install a Slide Rail by sliding steel panels, similar to trench shield sidewalls, into integrated rails on vertical steel posts, and then push the panels and posts down as a pit is dug. 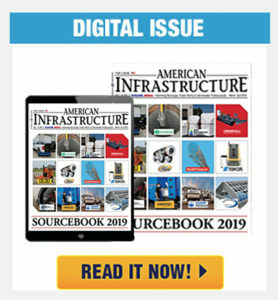 SSI worked with shoring equipment supplier Baker Corp. and needed to convince Ohio Department of Transportation (ODOT) that it would work and meet necessary safety requirements despite the difficult site conditions. After reviewing how the Slide Rail system works, going over the installation and removal process, and proving how the process meets safety guidelines with the ODOT, the team was given the green light. Targeting the underground system from top to bottom—or downstream to upstream—SSI was able to uncover and reroute an existing sewer line. Utilizing the same Slide Rail components from the first excavation, the second pit was dug and shored for the installation of the four deep pre-cast sump manholes, which contain the hydrodynamic separators. 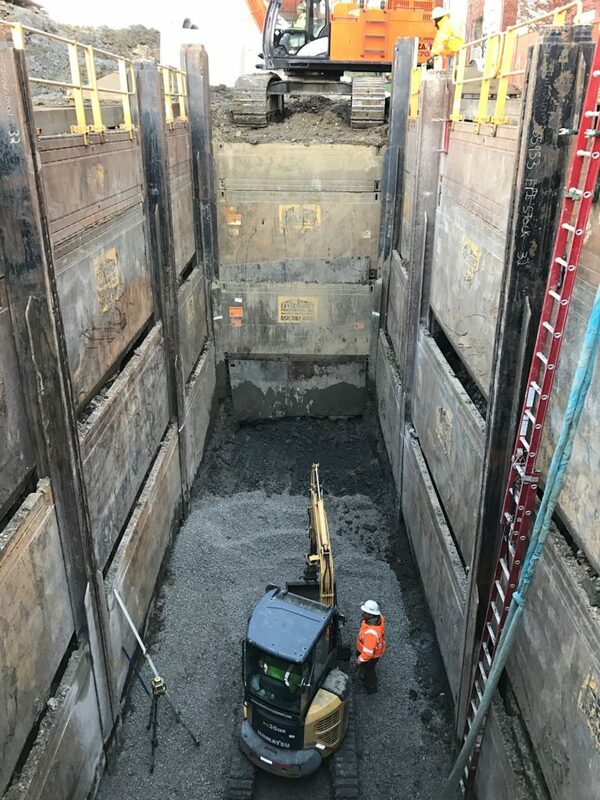 The third pit widened and lengthened the shored space just by adding a few more Slide Rail components, which allowed SSI to install inflow and outflow vaults and four 18-inch intake/outtake lines. “That’s where the manifold separates the water through the four, deep, sump manholes and through the screening process to clean it before it reenters the new piping that we built into Short Street,” Snode explained. Using shoring manufacturer Efficiency Production’s Slide Rail System—a leader in versatile trench shielding and shoring systems are designed, specifically for safe and cost effective installation of utility systems and infrastructure improvements—the system was successfully approached. 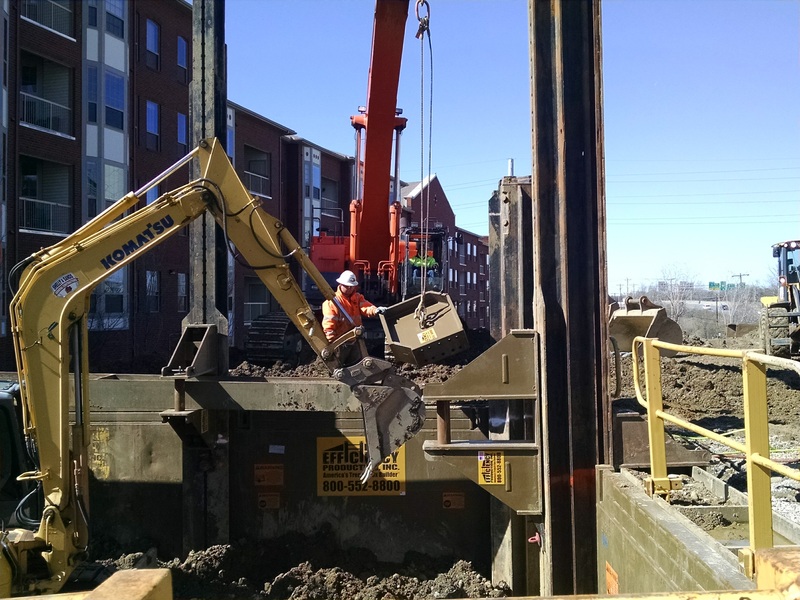 Because of the flexibility of Efficiency’s Slide Rail System, SHELLY & SANDS were able to make “on-the-fly” design changes to the shoring system when the large 96 inch existing storm sewer was not in the exact location indicated in the site plan. 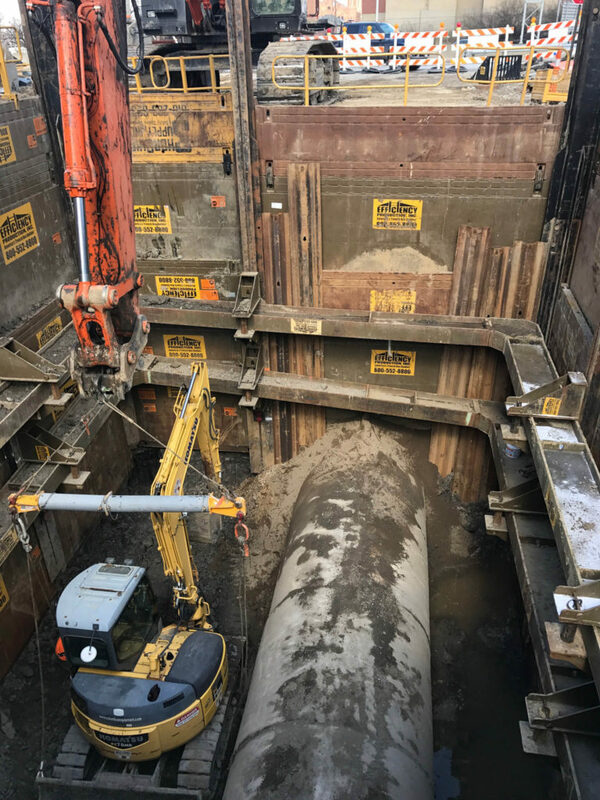 The fourth pit was excavated for an 18 by 11 by 28- foot tall pre-cast chamber which intersects a 96-inch existing storm sewer and diverts the flow through a more conventional 42-inch line down to the treatment structures. As the largest of the four excavations, it was shored with a 29 by 38 by 32-foot deep ClearSpan™ configured Slide Rail System. Completed in June 2017, the new sewer system is working efficiently and currently undergoes standard maintenance procedures for storm sewer systems. The entirety of the Interstate 70/71 Columbus Crossroads project will take approximately seven years to complete. The project will add an additional lane in each direction on I-70/71, eliminate several free-flow ramps at downtown street intersections, add a new ramp for I-70 eastbound to Parsons Avenue, and improve safety at three of the state’s Top 10 Crash Locations. 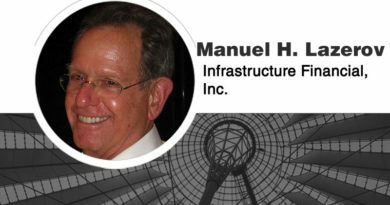 ← Is US infrastructure finance going green?